CLEMSON -- Eli Thomas had an emphatic block on an attempted jumper on Wake Forest’s Brandon Childress at the 10:59 mark of the first half which was a good indicator of how Clemson’s afternoon would go. Super Bowl Sunday will be a good one for Brad Brownell’s group as Clemson (13-8, 3-5 ACC) cruised past Wake Forest (8-13, 1-8 ACC) 64-37 in Littlejohn Coliseum. “Just a nice win by our guys. Really nice to see 40 minutes of defense. I thought our energy level was really high and our activity level was great. Anxious to see how many shots we contested, I thought we didn’t get up very many uncontested shots at all,” head coach Brad Brownell said after the game. The story of the game had to be Clemson’s defense. The Tigers forced seven Wake Forest turnovers in the first half, and on the defensive end, Thomas added seven blocks in the contest. Clemson was able to get things rolling offensively as Thomas opened the scoring with two quick layups early to put the Tigers up 4-0 out of the gate. The senior center, from Dallas, Texas, was a menace on the inside on offense and he and Javan White both played well in the paint. White added a two-handed slam, firing up the crowd, on one of Shelton Mitchell's seven assists during the contest. Clemson spread the wealth on the offensive end getting out to a 30-18 at halftime. 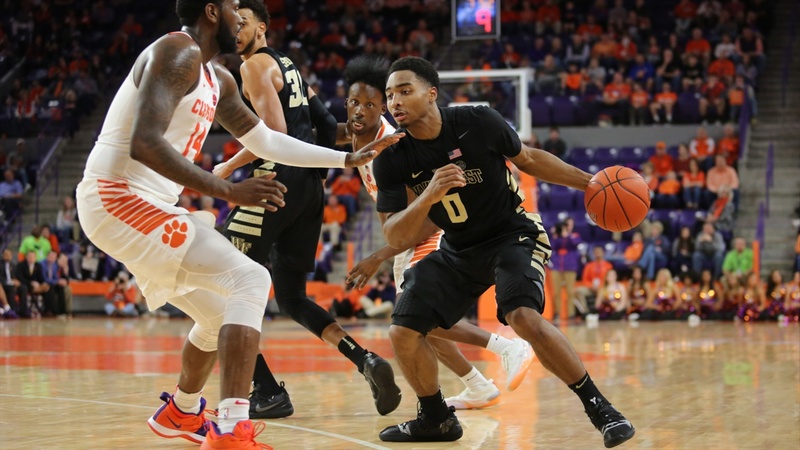 Wake Forest’s 18 points in the first half were the fewest first-half points allowed by Clemson since Nov. 13, 2015, against North Carolina Central. “The Pittsburgh game we played better (on defense), obviously the 13-0 run at the end of the game soured some things a little, but by in large our guys did a lot of really good things,” Brownell said. Thomas finished his strong afternoon with 23 points to go along with his seven blocks. He finished 10-for-11 from the field and 3-for-3 at the line. As for his coach, Brownell was excited to see what Thomas gave the team on Sunday. “Eli was special. He just was a difference maker and certainly his ability to finish and make plays around the rim was key for us offensively,” Brownell said. The second half was much of the same for Clemson, highlighted by a Shelton Mitchell three-pointer, prompting a Danny Manning timeout with 13:49 left in the game, which put the Tigers up 45-20. This kind of win for the Tigers is a momentum booster for Brad Brownell’s group. With two straight wins in ACC play. “It’s hard to win in this league. It’s hard to win significantly and we’ve done a good job the last two games of just continuing to keep playing, managing the game reasonably well. Hopefully, our team’s getting a bit better,” Brownell stated. This Clemson team seems to be headed in the right, but as Thomas noted, they are not finished improving. The Tigers will head down I-85 to face Georgia Tech in Atlanta on Wednesday night. Tip-off is at 7 p.m.